Tomate Aux Crevettes (Shrimp Stuffed Tomatoes) | Simple. Tasty. Good. Another Belgian classic: tomate aux crevettes! Or shrimp stuffed tomatoes. Or tomaat garnaal in Flemish. But before you run off to the grocery store, these ’crevettes’ are not the usual king or tiger prawns you and me usually prepare. These tiny grey buggers are found in just a couple of places, the North Sea for example. In French they are called ’crevette grise’, grey shrimp or brown shrimp in English and grijze garnaal in Flemish. You might also know them under the name of brown shrimp or bay shrimp. 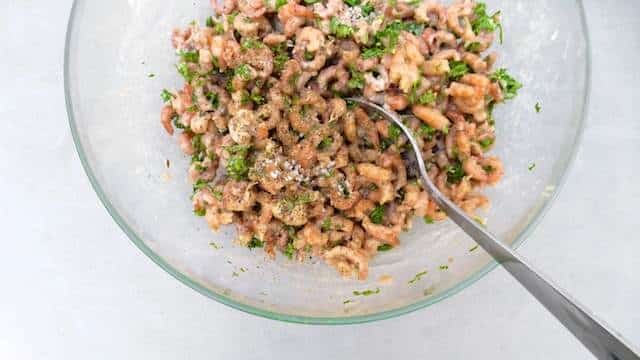 Evidently you can use any other type of cooked prawns, chop them up and then follow the rest of the recipe below. Other recipes with grey North Sea shrimp then: buttermilk mash with poached eggs, fried skate wing with butter sauce and a delicate leek and white wine soup! Shrimp croquettes or croquettes aux crevettes are also a delicacy in Belgium (garnaalkroket in Flemish). I haven’t made any with grey shrimp before but my Spanish prawn croquette version was quite close though! You can peel the tomatoes if you prefer. Therefore make a little incision on the bottom and poach the tomatoes in hot water for 15 seconds. Then peel them. I kept the skins on. 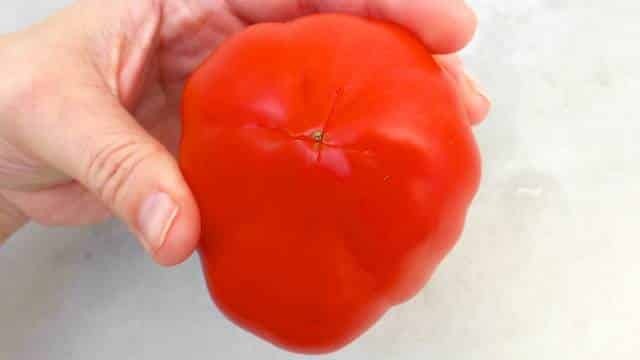 Slice off the tops of the tomatoes. 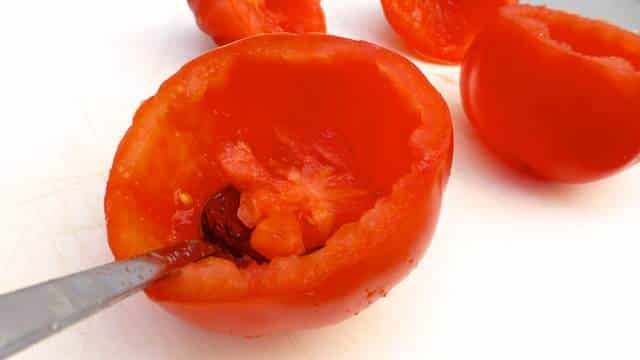 Remove the inside and seeds. Clean it up nicely. Try not to pierce the skin. Then place the tomatoes in the fridge. Now make the mayonnaise (if you are using store-bought mayo, skip the following steps). 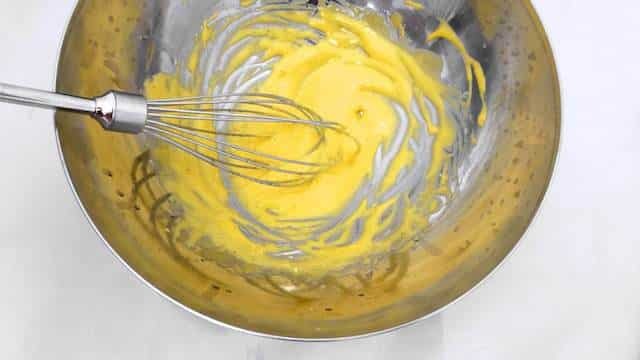 Add the egg yolk and the strong mustard to a large mixing bowl. Season with a little pepper and salt. The yolk should be at room temperature. If the ingredients are too cold, the mayo will split more easily. 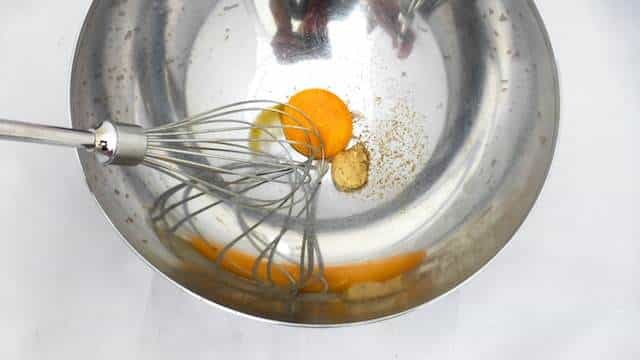 Then beat the yolk mixture quickly using a large balloon whisk. Then add the groundnut oil, drop by drop. Whisk in between additions. Don’t add too much in the beginning or the mayo will split right away. 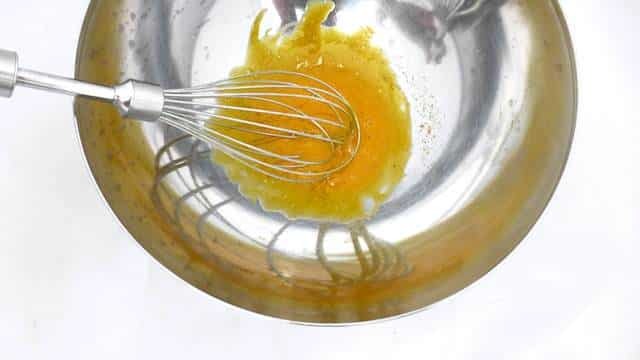 Keep on whisking the egg yolk and oil mixture firmly until it becomes a little creamier and thicker. Then add little splashes of the groundnut oil. The mayo should gradually come together and start to look glossy. Take your time. Once you have added all the groundnut oil, add the lemon juice. This will make the mayo paler. 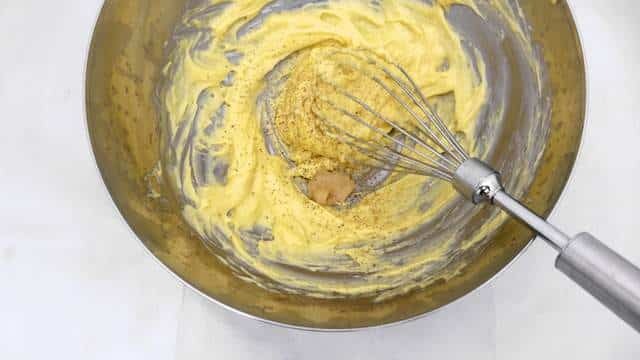 Then check the seasoning of the thick mayo and add extra pepper, salt, strong mustard or lemon juice to taste. 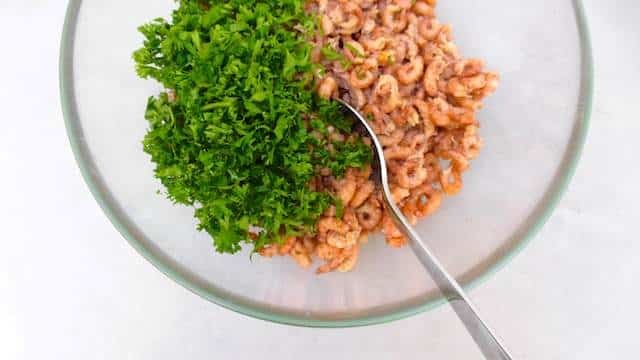 Transfer the grey shrimp to a large bowl and add the chopped parsley. Season with pepper and salt. Stir and then add the (freshly made) mayo. Stir the shrimp well again. 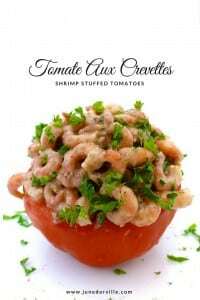 With a tablespoon fill the empty tomatoes with the shrimp salad.